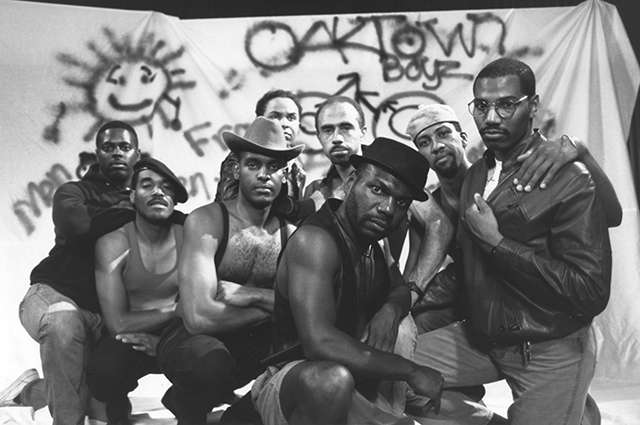 In Tongues Untied (1989), filmmaker Marlon Riggs gives a voice to communities of gay black men, presenting their cultures and perspectives on the world as they confront racism, homophobia, and marginalization. Join guest curator of Queer California: Untold Stories, Christina Linden, and local artist Blackberri who is featured in the film for a special screening of Tongues Untied, followed by a short Q&A. Members receive free admission. Program ticket included with gallery admission. RSVP required. Blackberri is a song maker, poet, writer, photographer, health educator, and community advocate. His music appears on the first anthology on Men's Music Walls to Roses: Songs of Changing Men, Gay Men's Music Strong Love: Songs of Gay Liberation 1972-1981, as well as the soundtrack for the Haight-Ashbury Radio Collective's History of San Francisco Knowing at the Gateway of Gold. He's written, performed music, and acted in films including the documentary Word Is Out: Stories of Some of Our Lives and Issac Julien’s Looking for Langston. In 2017, Blackberri was the Grand Marshal for San Francisco Pride and received the Audrey Joseph LGBTQ Entertainment Award, which honors those who have made a significant and historical impact on the LGBTQ community through artistic expression. Christina Linden is an Associate Professor in the Graduate Program in Curatorial Practice at California College of the Arts. As a curator, Linden strives for social relevancy and aims to present underrecognized voices. She is currently curating the exhibition Queer California: Untold Stories, where she previously held the position of Associate Curator of Painting and Sculpture. Previous projects at OMCA included work with Roy De Forest, Jedediah Caesar, the San Francisco Suiseki Kai, Michelle Dizon, Judy Chicago, and Marion Gray. Linden has also curated projects at Stanford University, SFMOMA, Kadist, and the Hessel Museum, and has instructed courses at Carnegie Mellon University, San Francisco Art Institute, California State University East Bay, and Bard College. Linden holds an MA in Curatorial Studies from Bard College, and a BA in Art History from New York University.